People don’t come to a salesperson with objections – they do indeed need something, but their fears may be what’s blocking the deal. To be a good salesperson, you need to know how to quickly understand the underlying behaviors of your client. Knowing the DISC traits of your client will allow you to approach the conversation with a different strategy and with selling points that will best relate to the customer’s direct needs. Find out what motivates your customer and appeal to them from that angle. Neutralize their objections, and be the game-changer to their future success. If they are motivated by trends, remind them why this product is in demand and who else is benefiting from your product or service. If your customer is motivated by prestige, show them how they will be ahead of the game by having the latest in technology or are the first to use this product and/or service in their area of business. In this type of situation, you may find that your customer is more worried about the actual experience than whether the product or service lives up to the value you present. Of course, you will benefit from a lifelong enthusiast if the product exceeds expectation, but in the case of an “I” style or an “S” personality, their motivation is not always based on whether something works or doesn’t work. Although an “S” is also motivated by security and practicality, as long as “their friends are doing it,” they are happy to do it, too! In the case of a “D” personality or a “C” style, they want facts, tangible results and assurance that they are actually going to benefit from what you are selling – even if it provides just a tiny bit of return. Don't worry so much about persuading them with the experience or by showing them the potential of their investment. They will only see this as “puffery,” and the details you provide will be assumed to be exaggerated. They want the bottom line and confirmation that what you are offering is actually going to work. They want results. They want to see examples. They want to have a guarantee that if this doesn’t work you are willing to help them find a solution that does or you will make it right in some way, shape or form. If you promised your client an exceptional customer experience, make sure they feel your sincerity and follow up to check in on whether you can help with something else. If they wanted results, check with them to make sure you delivered the product to expectation and on-time. As good sales people, we need to follow-up with our customers. We need to be sure we have solved their problems and that our customers are happy at all costs. This ensures they will return to us to solve any additional problems in the future. Remember, if you made a client happy once, most likely they will use your services again. They might even refer you to their colleagues, friends, clients and family. This is how you turn a good sale into a repeated success. 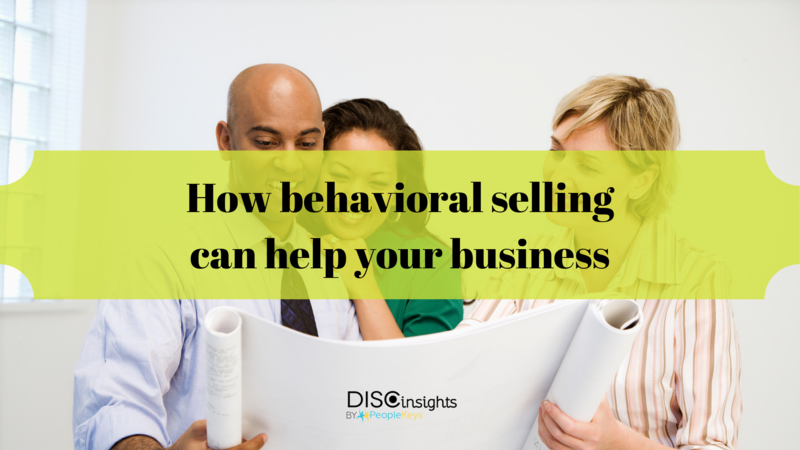 Behavioral selling helps you build a solid reputation and positive experience. In the long run, building relationships will bring your business to the next level. Find out how you can become a pro in behavioral sales today with PRO-SOLD.